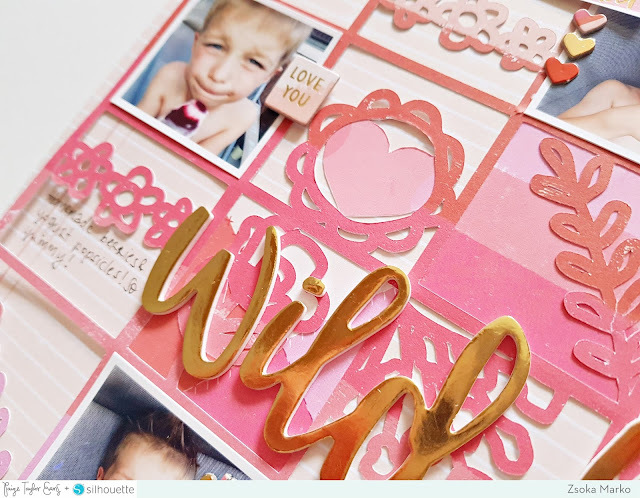 Check out this absolutely stunning and super cute layout by design team member Zsoka Marko! 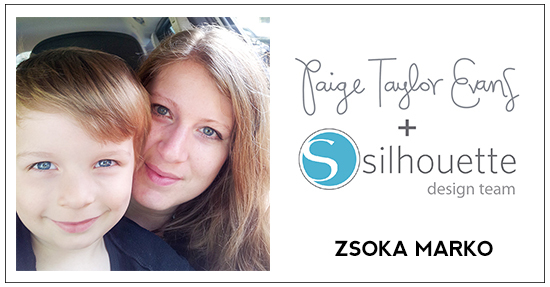 Hey there lovelies, I'm sharing a new layout today that I've created for the Paige Evans + Silhouette Design Team. I wanted to do something a bit different from what I normally go for and boy did I struggle with this layout! I had to bring in an extra set of eyes just to be able to finish it haha! I do like how it turned out though, so thank you friend (you know who you are!) for all the help. I chose the Grid of Flowers cut file and modified it a little. First I repeated the cut file four times, then mixed up the inner squares a little so they are more random, then I welded the four big squares (each one consists of nine small squares). I cut it out from Paper 24 from the Pick-Me-Up collection then backed a few of the squares with various patterned papers from the same collection. I adhered it to my background paper (B-side of Paper 20) and started decorating. I randomly placed my photos then went through all embellishments from Pick-Me-Up and pulled out the ones that fit the color scheme. My son is eating homemade berries and a yogurt popsicle in these photos and I thought the berry tones in this collection would be a perfect match. I used Stickers, Puffy Stickers, Chipboard Stickers, Ephemera Die Cuts, sequins and buttons from the Haberdashery Multi-Pack, and placed them wherever I liked them, no rhyme or reason. 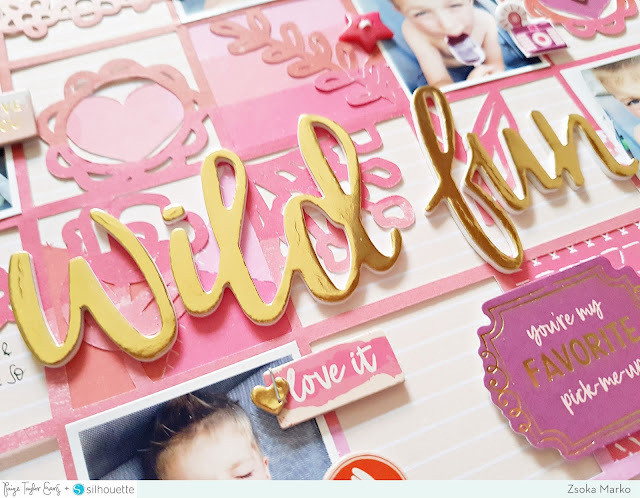 The title gave me headaches because I really wanted to use the gorgeous Chipboard Thickers from Pick-Me-Up, tone on tone. However they just got lost in the background. So I went through all of Paige's collections and chose the gold Foam Phrase Thickers from the Take Me Away collection - I love this font! To finish off my layout, I added the date and wrote my journaling. I hope you like how this page turned out! Thank you for stopping by! Such perfect photos for the berry tones in this collection! This is soooooooooooooooo wild and FUN!!! I love love love love this design!!! GORGEOUS!